當我之前的文章 Will the AntiVirus Cloud Works ? 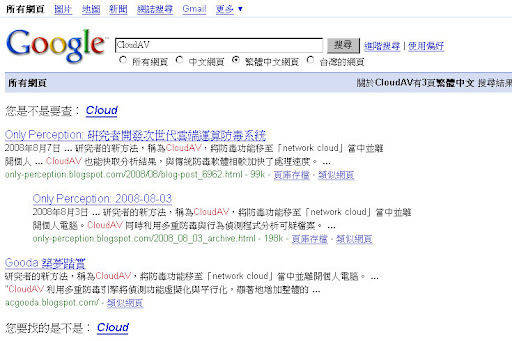 寫完後不久(8/10), 如果使用 CloudAV 進行查詢, 是可以在 Google 上找到的, 而且如果只鎖定繁體中文網頁, 基本上相關的網頁不多, 只有四個網頁分布於三個網站. 但是就在我再度查詢的那天(約兩天之後, 8/12), 當再次查詢時, Will the AntiVirus Cloud Works ?的文章卻不會在 Google 上出現了. 為此我特意把原本的文章發表時間做了修改, 改成比較新的時間(8/12)重新發表一次, 大約過了半小時, 於是文章又重新出現了. 結果就跟第一張圖一樣. 然而在過了一天後的今天(8/13), 文章又從查詢結果裡消失了, 而且這次連另外一個網站也消失了, 只剩下 Only Perception 的網站文章可以被查到. 如果說是因為搜尋結果量多, 導致被過濾掉或是排到後幾頁去, 我可以理解文章會從搜尋結果中消失, 或是移到後幾頁去, 但是當搜尋結果極少時 ? 而且是才 post 沒幾天的文章, 也出現了這樣的情況 ? This entry was posted on 下午3:32 and is filed under search engine , web engineering . You can follow any responses to this entry through the RSS 2.0 feed. You can leave a response, or trackback from your own site. 這篇寫出後不久, 用 CloudAV 作搜尋也找的到了, 但是前一篇依舊不會被找到. 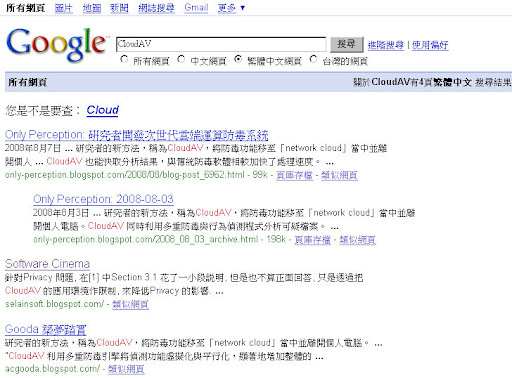 我試了一下, 用 "CloudAV seLain" 跟用 "CloudAV" 一樣都只能找到這篇, 但是前一篇 Will the AntiVirus Cloud Works ? 都一樣找不到. 會不會是同一個 blog 有不同關鍵字的文章只會出現一篇呢? 也許這是對 blog 這類網站的 filtering strategy. 畢竟在 blog 中重複出現同樣 keyword 的機率很高.